How valuable race horses and circus animals are transported from one place to another in record time. 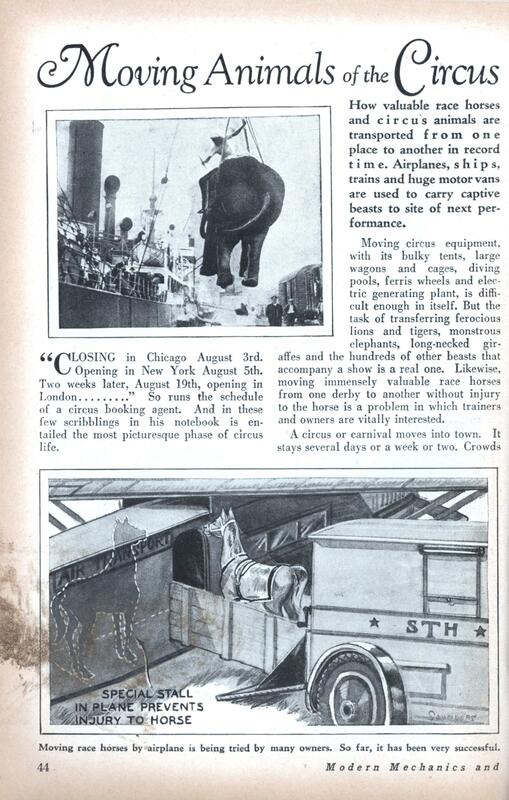 Airplanes, ships, trains and huge motor vans are used to carry captive beasts to site of next performance. “CLOSING in Chicago August 3rd. Opening in New York August 5th. Two weeks later, August 19th, opening in London………” So runs the schedule of a circus booking agent. And in these few scribblings in his notebook is entailed the most picturesque phase of circus life. Moving circus equipment, with its bulky tents, large wagons and cages, diving pools, ferris wheels and electric generating plant, is difficult enough in itself. But the task of transferring ferocious lions and tigers, monstrous elephants, long-necked giraffes and the hundreds of other beasts that accompany a show is a real one. Likewise, moving immensely valuable race horses from one derby to another without injury to the horse is a problem in which trainers and owners are vitally interested. A circus or carnival moves into town. It stays several days or a week or two. Crowds throng its shows the final night, and before the last person is off the grounds, crews of workmen begin tearing down the tents in preparation for departure to another city. Working in the spraying beams of huge searchlights, they are finished in a remarkably short time. The canvas is rolled into bundles, the stakes are ready for shipment, the wagons and heavy cages are given a final inspection. Through all of it, the elephants of the troupe have been doing their bit. Hauling huge tent poles, lifting, pulling, tugging, they are indispensable in the operations. They are the tractors of the circus. A chorus of bellows, whinnies, grunts and roars greets the train as the animals are led or lifted into their special cars. The engine whistles and is gone. Next morning residents of the town passing the site where gay flags and bright-colored signs and posters had been displayed, see only the bare spots worn into the green turf where the tents had been pitched. Scraps of paper litter the ground, and hay is scattered about here and there. The circus has moved on and is at that moment probably being put up again in a distant city. Circus moving in the early days was a tedious and dangerous job. Today, while it is still a difficult problem, modern means of travel and adoption of new types of equipment make it much easier—and faster. When schedules call for a booking across the ocean, more intricate problems ensue. Special quarters are provided for the animals aboard ship, and huge derricks are used to lift and lower the larger animals to and from the boat. A harness fits around their bodies and the big arm moves them about as if they were mere inanimate packages. A new wrinkle has recently been demonstrated in moving race horses. 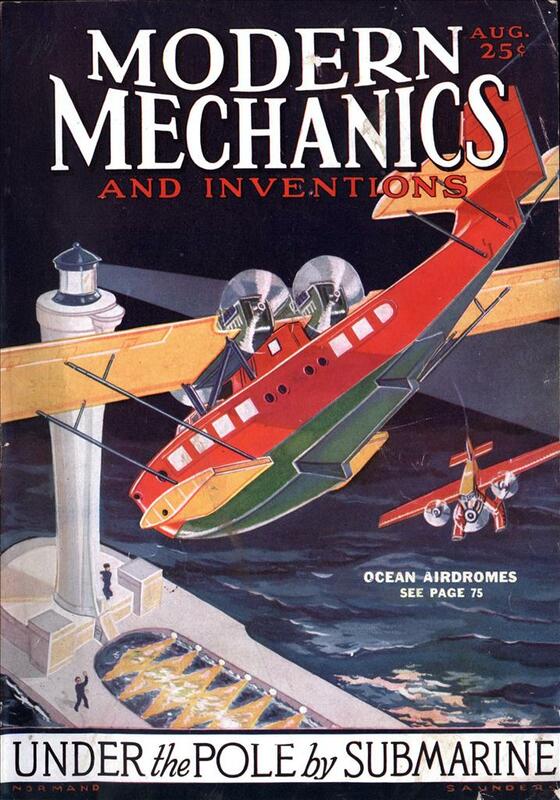 They are usually taken from one track to another by train, but transport airplanes have been found to be just as safe and far faster. A special stall is constructed in the body of the plane, and the horse is hobbled and tied firmly in a frame that holds his head and neck up and prevents him from moving about. Just like traveling in coach! Nah, these people cared about the animals.